Compact Hand Crank Hose Reels 1/2" ID No Hose are lightweight, compact, versatile reels that perform at working pressures up to 4,000 PSI. 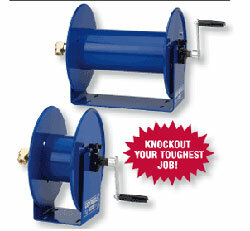 The sturdy “U” shaped frame and all steel construction make this one tough little reel and are supplied less hose. The brake assembly provides adjustable friction to brake or lock the drum. See table for specs.